Clear acrylic construction is highly durable and easy to clean. It also allows your customer to easily view items from all angles. 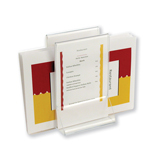 2 tiers allows you to store many items within one display without occupying too much space. Constructed of high grade clear acrylic. 4 tiers allow you to dispklay multipe items while saving space. Hinged rear door for easy access to products. 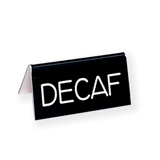 This is a "Decaf" engraved, table tent. It measures - 3"w x 1"d x 1.5"h. Construction is very durable and easy to clean. Black and white creat an easy to read contrast. This is a decorative, glass green, condiment holder table caddy, with space for a sign. Helps to consolidate items for easy access and organizational purposes. Portion control allows you to evenly dispense product every time. Clear acrylic construction is highly durable and easy to clean. It also allows your customer to easily view items from all angles. The double sided design allows this item to be easily access by customers. Clear acrylic construction is highly drable and easy to clean. Ships 12 per box. 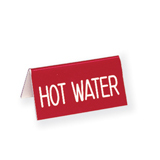 This is an engraved "Hot Water" Table sign. It measures - 3"W x 1"D x 1.5"H. Construction is very durable and easy to clean. Red and white creat an easy to read contrast. 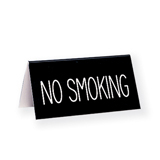 This is a "No Smoking" engraved, table tent. It measures - 3"w x 1"d x 1.5"h. Construction is very durable and easy to clean. Black and white creat an easy to read contrast. 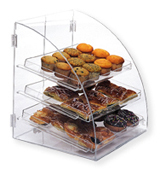 This is a curved front, coffee shop display case for baked goods. 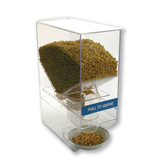 It has 4 different levels for displaying multiple items and keeping them easily sepereated. Curved style gives this case a uniques design element. Multiple tiers for displaying multiple items and keeping them organized. Hinged rear door gives easy access.